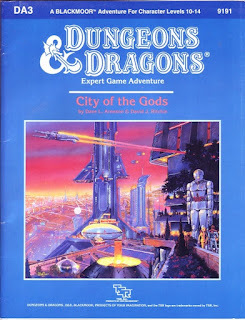 Finally DA3 City of the Gods is available at DrivethruRPG. Third in the series of DA modules, DA3 was that last in the series where Dave Arneson had much actual input. The final module, DA4 didn't even have Dave's name on the cover, although some things in that module must have come from Dave as well. When the module came out in 1987, many people must have been surprised to see the amazing cover by Douglas Chafee, showing a fabulous futuristic city that really sparked one's imagination of what a D&D module could be. The idea of fantasy heroes discovering a crashed spaceship had been explored in S1 Expedition to Barrier Peaks, but Dave Arneson had been matching science fiction and fantasy tropes in his games even before Blackmoor was invented. Stephen Rocheford's character had become central in what would become the Temple of the Frog adventure and the hints provided already in the first published version of that adventure (D&D Supplement II) would finally be revealed in this module. I was really happy to see DA1 Adventures in Blackmoor become available again because that is such a great introduction to the setting. DA2 Temple of the Frog gave us the most iconic adventure location from Dave Arneson's imagination. Now DA3 City of the Gods really shows us the extremes of the Minnesota gamer's experimentation with the genre. Hopefully it won't be long untill DA4 Duchy of Ten becomes available so that we can have the complete series on PDF format.